FLATIRON — Madison Square Park Conservancy’s latest art installation, made from enough hand-knotted rope to stretch the length of Manhattan 20 times, debuted Wednesday in Madison Square Park. 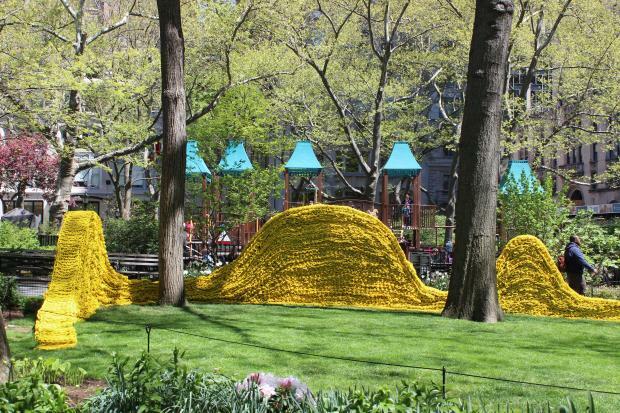 The massive installation, called “Red, Yellow and Blue,” is made up of 1.4 million feet of rope, painted with more than 3,500 gallons of paint, and creates colorful, wave-like structures throughout the green spaces of the park. “For Madison Square Park, I wanted to create a work that would impress in scale and still engage rather than intimidate,” said Orly Genger, the Brooklyn-based artist who created the work, in a statement. Mayor Michael Bloomberg and representatives of the Conservancy gathered at the park on Wednesday to introduce the artist, who spent two years working on the site-specific project. The rope used in the project was salvaged from various coastal areas within the city and was then painted with more than 3,500 gallons of paint. Genger spent the last two years hand-knotting the rope from a warehouse in Greenpoint, with the help of young artists and students, Bloomberg said. To install the work and secure its shape, hundreds of layers of rope had to be threaded through steel pipes, Genger said. “It’s a very labor-intensive building process,” Genger said. The artwork will be on display at the north, west and south ends of the park through Sept. 8.